normally when i discover a new restaurant or store, i like NOT to spread the word so it doesn't get crowded. i like to keep it my own little secret. but la mar is just too good not to talk about! la mar is a brand new peruvian restaurant (just opened on 9/29) that's along the embarcadero. this san francisco restaurant is the first one opened in the us; the others are in chile and mexico city. i had dinner there on saturday and thoroughly enjoyed the experienced! 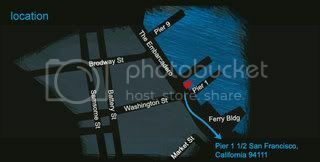 its situated at Pier 1, right along the water. the restaurant has large glass windows so you can enjoy the view. its open, airy and spacious. the service was excellent and very authentic. i think our server was actually from peru. we were served sweet potato (my favorite) and yam chips with 3 different type of dipping sauces. i liked all 3 but the red pepper sauce was definitely my favorite. we ordered the "cebiche tasting dish" which was 4 different cebiches (raw fish) with different type of flavors. it was very much like poke so of course i loved it. as i looked over the menu, everything just looked so good that i had a difficult time deciding what to order (let me also mention that i have never had peruvian food before and am usually not an exotic eater, so this was a new experience for me). 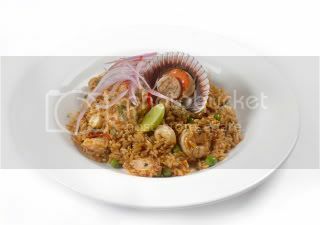 i settled on the "criollo" which is a regional fried rice dice with prawns, calamari, mussels and clams. i was not disappointed; it was very tasty! the combination of flavors blended so well together and the seafood was fresh! for dessert, we ordered a chocolate beignet with passion fruit reduction dish. YUM! i highly recommend la mar for the food, service, location and experience! if you don't believe me, check out yelp - rave reviews. i will definitely be a repeat visitor.